The beach at Puerto Armuelles. Could Puerto Armuelles Be the Next Hot Spot in Panama? 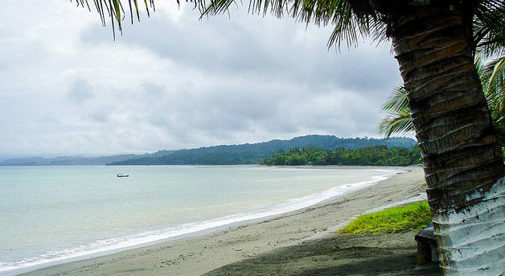 A combination of recent events has led investors to take a second look at the town of Puerto Armuelles, on the Panama–Costa Rica border. This small beachfront town on the Pacific is set to explode with an influx of money. There is already a growing expat community of people who have seen the potential and charm of this community. Puerto Armuelles was founded in 1927 by the Chiquita banana company, thanks to its deep natural port and perfect banana-farming land. The town is set in a lovely location on a beautiful beach, with long stretches of white sand and gentle surf. The downtown area is small and only about four blocks in radius. The town park looks out over the ocean at the old pier that was once a flurry of activity. Since the closure of Chiquita in 2003, interest in the town slacked off. But in recent years Puerto Armuelles has been revisited by people interested in Puerto’s natural deep port. In May of 2017, Del Monte signed a contract to start up the banana business again, and hiring has already begun for 5,000 workers. The Royal Caribbean cruise line is interested in having Puerto Armuelles as a cruise destination. In late 2017, a proposal was given to the government for a four-lane tunnel, for three cargo trains and one passenger train to run from Puerto Armuelles to Bocas del Toro, named the Dry Canal. This would allow overland transportation of containers and other materials, bypassing the need to use the canal. You can already see improvements; a four-lane highway from Paso Canoas to Puerto has been completed, as the government is preparing for more activity. Developers have planned North American-style housing projects, with building set to begin in the next few months. There is a huge mix of homes up for sale below market value. Some of the 1950s company homes that once housed high-ranking Chiquita employees, boasting three bedrooms and two bathrooms—with hard woods throughout—can be bought for $125,000. You can still buy a beachfront home in Puerto for under $100,000. The opportunities for business startups accommodating the increase in tourism is completely open. Anyone with an imagination can see the potential Puerto now has and how quickly things will change here. The expat community continues to grow in Puerto, which is residents from all across North America and Europe. Puerto does need improvements, and you can already see some of them being accomplished. A new hospital is about 50% finished and a new baseball stadium is underway. Whether you are looking to invest for appreciation, start a business, or live an inexpensive beach lifestyle, you should check out Puerto Armuelles soon.